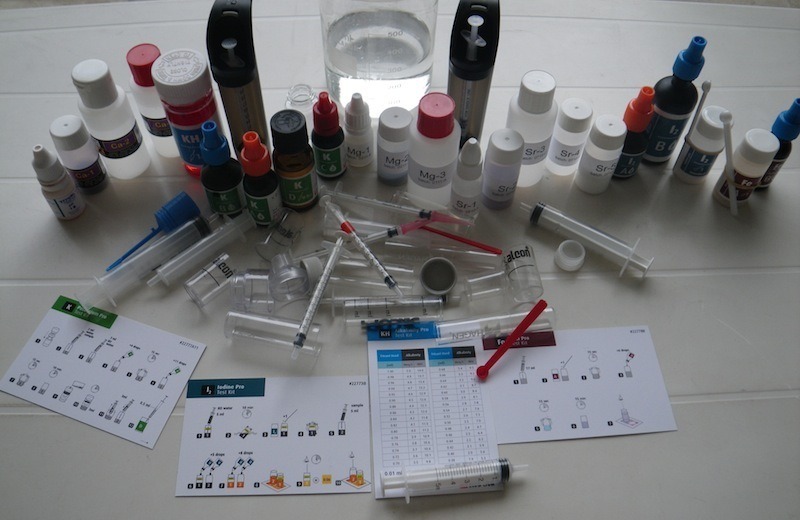 Understanding water chemistry can be one of the most frustrating aspects to new or seasoned aquarists alike without a formal education on calcium and alkalinity and how they can affect each other. Most hobbyists do not like to read scientific writings about water chemistry or look at scientific equations ([SiO(OH)3?] + H+ ? [Si(OH)40]) depicting such and not understand what they are even looking at or reading about. Orphek will attempt to simplify marine water chemistry in this article. Stable and consistent levels of calcium and alkalinity not only insure growth of calcareous invertebrates, but also are required for their survival in both the ocean and our captive systems. Coral, coralline algae, and animals with shells are made up of more than just calcium; they also contain carbonates which are called buffers. Buffers contain calcium carbonate, borate, and bicarbonate. Without these buffers or carbonates, corals cannot lay down their calcium skeletons which make up the massive coral reefs found in our oceans. Corals absorb bicarbonate and process it into carbonate in order to build their calcium carbonate skeletons. Proper lighting of the correct intensity and spectral range is also required. Magnesium also plays a role in calcification, without its presence corals cannot absorb the calcium in the levels that are available to them. Magnesium levels are three times higher than calcium levels in natural seawater and should also be maintained in that ratio in our captive reef systems. 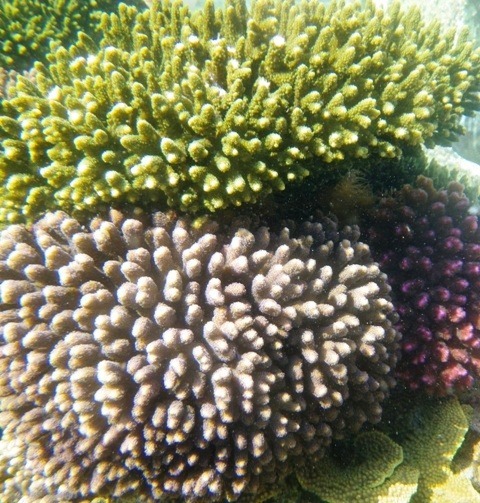 Calcium (Ca) level of 400-450ppm and a magnesium (Mg) level of 1200-1350ppm are recommended for mature corals. For faster growth of frags and juvenile corals, Orphek recommends a calcium level of 465ppm, Mg at 1390ppm, and dKH at 12.6. The higher dKH provides additional carbonates to increase growth rate and the higher calcium level compensates for increased calcium absorption by the corals. Mg is increased to adjust for the recommended three to one ratio of calcium and magnesium. These increases balance out the water chemistry and they are not raised to a level which would cause precipitation. dKH (Degree of Carbonate Hardness) is not a thing in the water nor is it an element. It is a measure of whether adequate carbonates are present in the water to ensure continued coral growth and to keep the pH stable. Carbonates increase alkalinity levels much more than bicarbonates and well designed buffers should contain about 85% carbonates to maintain a pH of 8.0. In natural seawater, alkalinity varies between 6.2 to 8.2dKH (depending on location) and is maintained by the occurrence and dissolution of carbonate rocks/coral skeletons and carbon dioxide in the atmosphere. The presence of carbon dioxide in seawater helps to slowly dissolve carbonates and this is why CO2 is used in calcium reactors. Now that we have a good idea of how these elements interact with each other in nature, we will move on to how these elements can change and effect other elements and parameters in our home systems. The ideal pH for our reef systems is 8-8.2. In the ocean this is easily maintained due to the enormous surface area which exchanges CO2 for oxygen, and the fact that very little dissolved nutrients are present which can acidify the water. In our captive reef systems this can be challenging, especially if we overstock our systems without proper filtration, air exchange, nutrient export, water flow, and adequate alkalinity to keep pH levels at a desirable level. Protein skimmers are highly recommended and should be selected at a capacity rated twice the size of your reef aquarium. This will ensure efficient nutrient export which will minimize buffer dosing. The two factors which lower pH are excessive nutrients and carbon dioxide and both of these are generated from excessive animal stocking which leads to more animal waste and carbon dioxide. Fish expel carbon dioxide with every breath they take and this can be minimized by using the largest sump your space will accommodate. This provides a larger surface area to ensure good gas exchange and oxygen uptake. A good flow rate in the aquarium is also necessary so water is constantly moving and being drawn into the sump where CO2 can be exported and oxygen imported into the system. It is not unusual for pH levels to drop by as much as three units (0.3) in the evening because photosynthesis, which utilizes carbon dioxide, does not occur which in turn can lower pH. Good flow rates also keep detritus and uneaten food in suspension where they can be exported into the sump where scavengers can feast on them and/or the protein skimmer can export them out of the system before developing into dissolved nutrients. A non laminar flow is highly desirable and the use of programmable pumps such as the Ecotech Vortex MP models easily provides this. The use of this pump technology ensures good water movement in all areas of the aquarium and is more natural for a coral environment. A total flow rate of at least 12 times the aquarium volume is highly recommended. The dKH of a reef system should be kept at 7 to 8.5. Levels above this are not necessary in a well maintained system and are undesirable as it can lead to calcium precipitation. Acids commonly known to lower dKH levels are CO or carbon dioxide, nitric acids and organic acids, the latter two being derived from sand beds containing large amounts of detritus and from uneaten foods and waste which turn into dissolved nutrients which lead to higher than acceptable nitrate levels. Some aquarists with heavily stocked aquariums will provide a means of carbon dosing in an attempt to lower nitrate levels. This process basically involves feeding nutrient eating bacteria with a carbon source which causes them to multiply in large numbers which in turn consume more dissolved nutrients thereby reducing acids in the water. These nutrient rich bacteria slough off and become suspended in the water column and provide a good food source that are readily consumed by corals and other filter feeding invertebrates. A word about calcium precipitation is necessary here and we will try to explain this in a clear manner. Many aquarists tend to keep dKH levels higher than necessary thinking more is better. This is not the case with buffers (carbonates). It is only possible to dissolve a given number of solids in a given amount of seawater, and these include calcium, carbonates, and most every element found in seawater. For a simple analogy we will use poker chips to explain. If we have a hundred poker chips that completely fill a bowl and seventy of these chips are red to represent calcium, and thirty of these chips are green to represent carbonates or buffers (alkalinity), in theory our bowl is filled and we cannot add any more. If we rapidly increase the red chips (calcium), some of the green chips (alkalinity) would have to be removed. So by dosing excess amounts of calcium (red chips), we precipitate the carbonates (green chips) out of solution thereby causing what is known as the “snowstorm” effect. Many aquarists that see this effect immediately begin to dose other elements in an attempt to balance this out. This is foolish and will not work, it will only feed the effect by trying to add more chips in an already over filled bowl which can lead to increased precipitation. This event will have to run its course and only then can you slowly establish a calcium/alkalinity balance within the aquarium. Calcium carbonate precipitation can be even more drastic at higher pH levels that can occur if Kalkwasser is used and is not slowly dosed. As the pH rises, the amount of calcium and alkalinity that can be kept in solution without precipitation decreases. High pH levels will convert much of the bicarbonates present into carbonates which lead to carbonate spikes which again produce the snowstorm effect. This is why you see residual on the bottom of a Kalkwasser mixing vessel, it cannot go into solution due to an excess of carbonates. 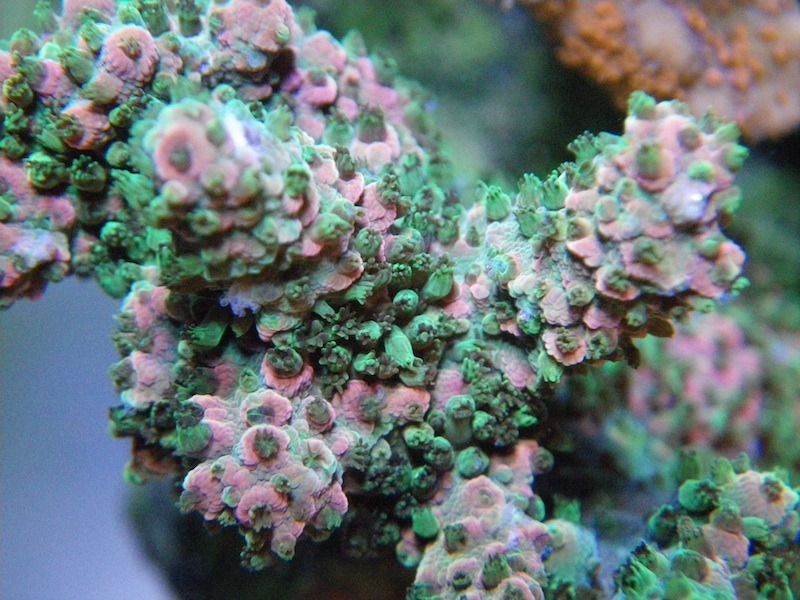 Keeping your water chemistry balanced by regularly testing for pH, calcium, alkalinity, and magnesium will assure continued health for your reef inhabitants. If you need to raise or lower calcium or alkalinity, do it slowly and do one at a time, not both on the same day. Orphek hopes this will simplify your understanding of how calcium and alkalinity can react with each other. 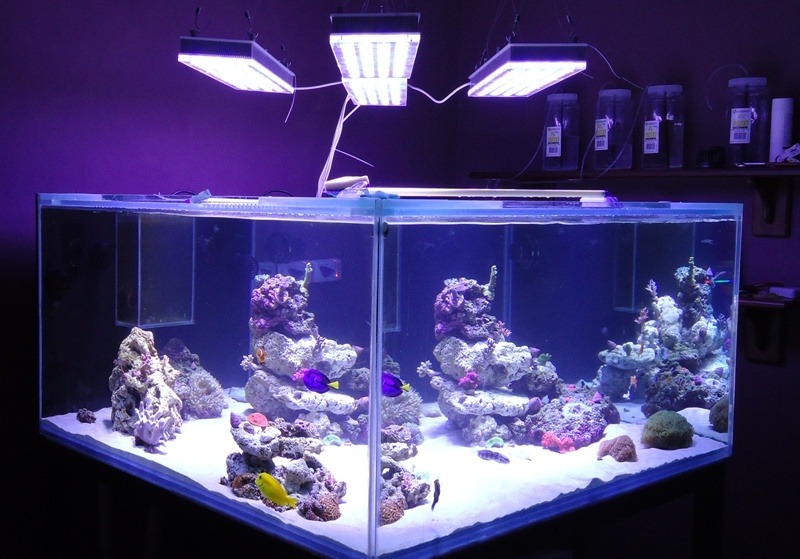 Orphek doesn’t just produce high PAR/PUR LED lighting for your corals, we extensively study corals and their reactions to both lighting and water chemistry. 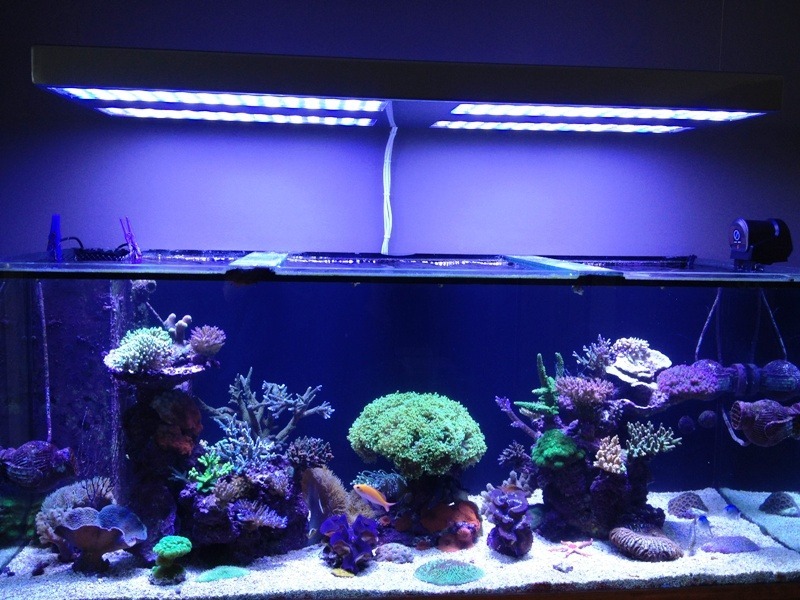 Not only do we produce the best lighting for your corals, we want your corals to grow and thrive and provide this information to you, the aquarist, our highly regarded asset.